Branding is really nothing more than the process of building trust, then building upon that trust to reinforce the unique things you offer as an artist, such as your unique style; your voice; your acceptance by others, such as collectors; and your price and value perception. Everything you do contributes to your brand, in a positive or a negative way. Facebook and Instagram can be great tools for building credibility as part of your branding, and many artists are relying on them heavily. One artist even told me he no longer needs to advertise because he has so many followers. But that's just his ego getting in the way: When I asked exactly who was following him, it was clear they were peers -- other artists -- and few if any collectors. People tend to gather with like-minded people, so artists tend to follow artists. Collector groups are much more difficult to find, and are more likely to be found on LinkedIn, which tends to attract professionals and serious interest groups, than on Facebook. One giant mistake I'm seeing on Facebook is "Hey, look at me!" syndrome. I suppose if your followers are fellow artists, there is little harm in that. But if there are any collectors watching -- directly, or indirectly, via other artists' followings -- it can be dangerous. I'm seeing many an artist posting everything they paint when, fortunately or unfortunately, we all need to edit and show only our best work. Even the best painters have dogs they should never show. Yet it's so tempting to say, "Hey look at me and what I'm capable of doing!" that we can forget to edit. I'm seeing a lot of "undercooked" work and, worse, a lot of paintings in progress. For artists, a progress shot is fine, but I'd be reluctant to let potential collectors see it. Has someone ever come up to you while you were painting on location, when a painting was only half done? It happens to me all the time, and I find myself explaining, "I'm just getting started, come back in a few hours," because they are judging a work at an uncooked stage. I've overheard comments like, "It's not very good, it doesn't look right" at times when it's too soon for review. Most consumers don't understand that an unfinished painting is just that: unfinished. This is why I think showing unfinished works on Facebook and other social media has the potential to hurt your brand. That's also why editing is important. You wouldn't put every painting you do in a gallery. Why do it anywhere else? Every touchpoint impacts the perception of your brand one way or another. Sometimes I'm tempted to post something after a drink or two, when my judgment is a little impaired, and I usually regret it in the morning. Again, if your Facebook or Twitter or Instagram have just friends and family, you probably won't do much damage. But if you have a big following, it's smart to make sure that everything you do is reinforcing your brand in a positive way. Artists should seek things to post that will be positive reinforcements. Every time something great happens to you, post it. For instance, if you win an award, post it. If you get accepted to a new gallery, post it. That's why I like online art competitions. For a few bucks per entry, you have lots of opportunities to win or become a finalist. It's just another thing to talk about. Artists should enter every legitimate competition they can, to increase the odds of a win. A good marketer is always inventing things to talk about to build credibility -- things they can put online, put in their newsletter, and shout from the rooftops. A bad marketer just puts everything out there, good and bad -- and that can have a negative impact on their brand. One artist I'm thinking of has gone backward in my mind because he's posting party photos, progress paintings, paintings that should never be released, and other things that are hurting his reputation. Visibility isn't always good. P.T. Barnum is supposed to have said there's no such thing as bad publicity. That may be true if you're running a circus, but I'm not sure it's best for your art career. PS: I'm getting cramps from signing big checks for large amounts of cash. Today you have a chance to become a winner or finalist and possibly put $15,000 cash in your pocket if you win our annual PleinAir salon. Tonight at midnight Pacific Time is your deadline to enter. All it takes is an upload of one great painting, or several. Many artists have found that repeating entries month to month benefits them because if they're not picked by one judge, they might be picked by another. To enter, visit www.pleinairsalon.com and start thinking about how you'll use that $15,000 cash prize and how your career will soar when you're on the cover of PleinAir magazine. Enter here now. Fireworks will light the skies around our great nation this week as we celebrate our independence as a country. Yet thousands of artists I hear from are lacking independence. They long to quit their jobs and create their art full-time -- without having to live the life of a starving artist. Yesterday I met a man who told me the story of spending years in art school to get his MFA, yet he was never able to make a living with his art. He said to me, "No one around here can make a living as an artist." I didn't want to disagree, but I know artists nearby who actually make a great living as artists, and who are not as accomplished as he. The reality is, you can quit your job and become a full-time artist and make just as good a living or better in most cases. If that sounds like a stretch to you, it's not. I work with people every day who have done it, including some professionals who were already making excellent money. One artist who follows my plan sent me a photo last week of a pile of checks. She is living the dream, just three years after she started. One of my missions in life is to help artists (painters, sculptors, photographers, crafters, etc.) live their dream. I have lived the life of dreading going in to work every day. I have stared out the window, wishing I was not behind my desk and that I could be painting. I have been jealous when my friends were traveling to faraway places to paint and I was limited to my two weeks of vacation (and I couldn't afford to go anywhere even when I had time off.) I have lived hand-to-mouth, I have struggled, I have had bosses I could not stand for one more day and yet had to bite my tongue because I needed the job, days when I wanted to sing, "Take This Job and Shove It" and just walk out. It took my getting to the boiling point before I made a change in my life. Enough. I'm Out of Here! The most important moment in your life is the moment you can't stand it anymore, blow up and say, "ENOUGH! I'm out of here!" But it's also the most dangerous time, because, like a pressure cooker, hatred of a job can build up until we eventually explode. Unless you find a way to relieve the pressure in advance, you'll do something stupid, like quit your job when you're not ready, when you don't have an income. Something terrible happens when you stay in a job you hate, when you fail to take the risk and live the dream. The longer you do it, the longer you take it, and eventually you lose your drive to escape. You start to lose your dream because you don't see any way out. One day you wake up and your whole life has passed and you haven't lived your dream. By the time you get to retirement age, you may not have the money, desire, interest, or physical ability. Why wait? On the 4th, I want you to make a commitment to yourself. Every time you hear a "boom" or see a firework go off, I want you to say to yourself, "This is my year of independence." I don't want you to go in on Monday and quit your job, nor do I want to get calls from you saying, "I did what you said. I quit my job. I can't feed my family. Now what?" What I want you to do is to devote any free time you have in the summer to building a plan. When you have a plan, you already have a sense of freedom. Knowing you have a plan for how you're going to morph from a worker bee into a free-living artist is almost as good as the freedom itself. It's kind of like planning a vacation a year in advance and having all year to look forward to it. Somehow it helps you cope with stress. Nothing worth doing is easy. I can't give you a specific plan because each of you is in a different place. Some are near retirement, others are early in their careers, some are raising kids, others have college to pay for. What I can tell you is that it's really pretty simple to invent a plan that fits your needs. Here are six specific things you can do. 1. Start with commitments and reality. Two weeks ago at the Publisher's Invitational, I met an artist who was taking her first trip away from her kids alone, ever. Her youngest is in college, and she now can start living her dream. She knew she had to get the kids out of college first. Those were very real circumstances. So write down the reality of your commitments so you know the moment you can be free. 2. Seek a transition plan. This very artist told me her story, how she dreamed of becoming a full-time artist and traveling. She said, "Just like I have to breathe, I have to paint." She told me that she had to work, make a living, and raise her kids, but she knew if she did not paint, she could not live. So she made up her mind to work on her art when her kids were in school. She found a way to start a gallery in town, where she showed her work. She could close it when she needed to deal with the kids, and she has been running it most of their school years. By working TOWARD her goal, achieving part of it, she saved her sanity. There are many ways to invent a transition plan. I don't have any desire to retire and I love what I do, but I have told myself that once my kids are in college, I can travel more and work a little less. I'm working on a transition plan by getting my company gradually prepared for me to be absent a little more, but I've also had my work in a couple of art galleries for the last 10 years. I intentionally don't market it (the plumber's house always leaks, right?) because I'm not yet in the mode where I need that income, yet it's a way for me to challenge myself to paint better and paint more, and a way to get used to the gallery environment. It's important to put yourself under pressure to reach your goals. 3. Develop a financial plan. Lay out your needs and where you'd need to be to quit your job. A friend of mine set a five-year goal to sell enough paintings monthly so he could quit his sales job. He set annual goals that grew each year, and he worked all his spare time beyond his family and job to hit those goals. On weekends he visited galleries. At nights he painted. 4. You have to be so driven that you'll work doubly hard. Again, nothing worthwhile is easy. You may have to work extra jobs for a year, or a few years, to save extra money. You may have to work late at night and on weekends. If you want it badly enough, you'll find the time. I recently laid out a plan for my friend who is trying to get more painting time around his family and work. I simply said, "Sleep less." So instead of staying up till midnight watching TV, he goes to bed earlier and awakens at 5, giving him two hours of painting time before he was to wake the kids for school. He is so driven that he has not missed one morning, seven days a week, for the last three months. 5. Be disciplined about your goals. Each week I receive a report about where I am regarding my goals in my business. It's weekly -- rather than monthly -- so I know when I have to hit my numbers while I still have time left to do it. I am obsessed with never allowing myself to miss a goal. I beat myself up when I do, and I make a point of making it up in the next month on top of my new monthly goal. This is the ONLY WAY to make sure you hit your goals. If your goal is to produce five paintings a month, you must NEVER LET YOURSELF OFF THE HOOK. Never give yourself an excuse. Excuses are for wimps. Winners never say, "I'll try." They always say, "I'll do it." 6. Remove the garbage in your head. As you read this you may be thinking, "Well, it works for him, or it works for others, but my circumstances are different." That is complete head garbage. This week I was coaching an artist on his marketing and he said, "I can't do that because there are lots of younger artists who are better at getting their names exposed by using technology." I said, "Let me guess. When you were younger you gave yourself excuses, saying, 'I can't do that because the older artists have more experience and contacts and advantages.'" Dead silence. We all have garbage in our heads. We all tell ourselves that things are not possible, that others have bigger advantages. Stop it. When you catch yourself doing it, stop it. Everyone does it, winners just work harder at stopping it and redirecting their beliefs to what they can do. If you use these steps to build a plan, it will set you on the path to independence. Life is very short. It's amazing to me how fast it goes by, and how many dreams I've missed by not holding myself to standards and goals. I reach more of my goals today than I did 10 years ago, and I refuse to let one of them slip. As a result my business is growing, my personal life is improving, and I'm living a dream I never thought possible. You can do it. Make this Independence Day the beginning of your independence so you can live the dream. PS: OK, here I go. I'm going to invent something now, on the spot, commit to it, so I am getting it done and so YOU will hold my feet to the fire. 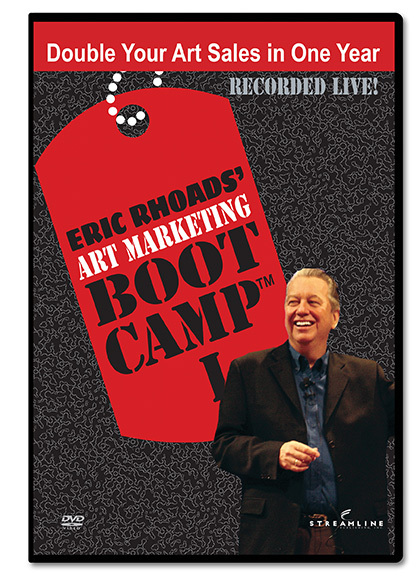 For the last three years at the Plein Air Convention, I've done three different Marketing Boot Camp sessions (three days each) to help artists with the essentials of artist marketing. It has transformed careers. But I think it's time for me to offer something completely new. So here is my new commitment and an official announcement so new, it's not even on the website. Next year for the Plein Air Convention, I'm going create a new series: "How to Quit Your Stinking Job and Live the Dream of Being a Financially Successful Full-Time Artist." 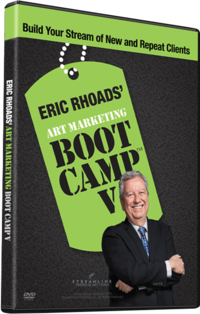 Not only will this be a blueprint for success to launch your career as an artist, it contains mission-critical information and tools most artists need even if established and successful. This is the tip of the iceberg. I've only just begun to design this program, and I have until April to find out what exactly you want from me and build it into the program. Though this program has to do with going out on your own, it will be a huge boost to those of you who are already there. The base business strategy alone will revolutionize your life, as it changed my life and success when I learned it from one of my business mentors after two decades in business. These early-morning sessions will be held each morning of the Plein Air Convention and at no additional charge. Note that the convention attracts over 700 artists and will have dozens of top artists teaching oil, watercolor, pastel, and acrylic. Most are not listed on the website yet. Plus we have sessions for landscape and figurative artists. You don't have to be a plein air painter to attend, because most demos are indoors on four stages, with video so you can see them well. Frankly, the new sessions will be well worth the price and will change your life and help you live the dream. To register, call 561.655.8778 or visit www.pleinairconvention.com, or register here. We even have payment plans available so you can stretch out your attendance investment.